Another wet August Sunday afternoon. But we had shelter. Under the Circe Pavillion. In Liberty Park. Or Eileen McLoughlin Park. I don't know why it has two names. Maybe it's trying to re-invent itself? Unfortunately, while the druggies are still using it, it's going to be a struggle for families and children to reclaim the area. As always, though, with Dublin Sketchers, there was strength in numbers, and we managed to make the space our own for a couple of hours. 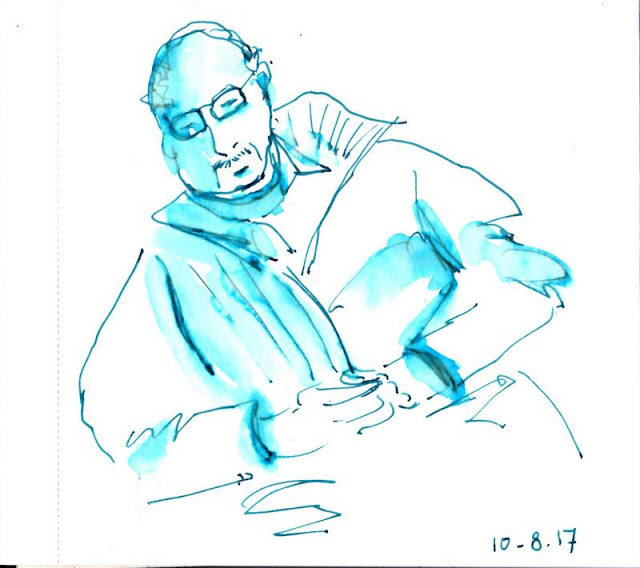 We were joined by Jay, of the Hardwicke Street Community Garden, and Mark, who was just taking shelter from the rain, but happily started sketching and even more happily got his portrait done by one of our talented sketchers, Des. So, despite the pouring rain and the cold, it was a good afternoon. And then we met up in the Parlor Café in the North Star Hotel, a cosy, modern and friendly space, with not just one, but two slices of banana bread! So much for portion control! Many thanks to the Treeline Project for making the space available to us, and to Mary for bringing chairs! Was very happy with this sketch - despite the fact that the proportions of the building in the background are completely wrong. Believe me, completely and utterly wrong! My solution when that happens is to splash loads of yummy colours. Always works! A few of the trees in the park. Jason's sketch, which he left with me. Pretty good sense of volume and proportions for someone who hasn't drawn since 6th Class! Not quite as ambitious as a big Kerry landscape. But I picked up this bunch of berries in UCD last weekend - I think they might be from a linden tree. But my knowledge of trees is limited. It's one of those things. Fish and trees actually - and don't ask me for a translation, into French or English. It's just one of those things that refuse to stick to my brain cells. I wonder why? And yet, I love trees. And fish. I can name exotic coral reef fish, interestingly enough. I have this small block of Fabriano watercolour paper (about 20x15cm) and it's good for experimenting. Definitely should do more of that. More experimenting. More painting. More drawing. I think about it a lot, but if I look back at any given day, I don't actually do that much. Took so many photos. I don't know where to start. I painted this at the kitchen table. A convivial and inspiring place. As was our visit to the Mill Cove Gallery in Castletownbere. In particular the works of Kasper Zier (of unreachable beauty for my level of skill) and Monica Groves (the photos in the link don't do the pieces justice). So I tried to catch something of the landscape we had driven through the previous day. The Healy Pass stood out in terms of its scale and sheer power. I still don't know what those rocks are. Time to do a geology search! A productive few days off down in Kerry. Painting before breakfast. A good way to start the day. Even if the end result is more of a any other name! I got fed up with my sunflowers. I start painting a sunflower field! At least, I've got only one version of this one. But I might need more to get to what I have in my head. The main thing that bothers me here is the blob on the left - it was supposed to be some bushes and trees, but somehow it lost its shape along the way and looks like some alien monster from Star Trek (the original series - special effects got a little more sophisticated by The Next Generation). I'm trying to explore new ideas and textures that take me away from a strict representation of what my camera captured. And I hope the yellow sky conveys the heat of the day. Although it wasn't that hot - just about 30 Celsius. Which to me is normal Summer temperature in the South of France. Quite pleasant actually! And the joy of sitting out on the terrace for breakfast and dinner. A rare treat when you live in Ireland. I think I'll need more sunshine and warm weather next year. But I'll have to watch my carbon footprint, or we'll end with those temperatures in Ireland, which really wouldn't be right! Back to the blob - how would it look if I cropped the painting? That's one of the beauties of watercolour paper - something you can't do with a stretched canvas! One big advantage of travelling alone is that I can get to the airport when it suits me, allowing plenty of time for shopping and sketching. On this occasion, it did mean getting up at 3am. With a MyTaxi booked for 4am, and a FastTrack through security (the best thing ever), I was at the airport with two hours to spare. 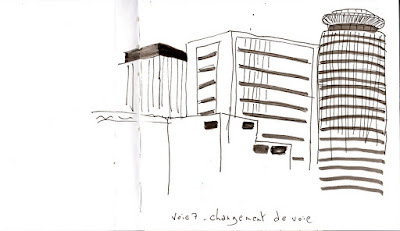 Travelling with hand-luggage only, I couldn't do any shopping, so that left plenty of time for sketching. I got myself a green tea and a gluten-free muffin of some sort (which tasted awful, by the way, but I didn't want to queue for the more appealing food options), then I sat down at a counter overlooking the bar. Nobody noticed me - people have their phones and they are pre-occupied, plus they're not quite awake at that time yet. To really finish that sketch, I probably would have needed an extra half hour or even an hour. But I had a plane to catch, so that's all I've got! And then, there was a train to take. Good open spaces, train stations. 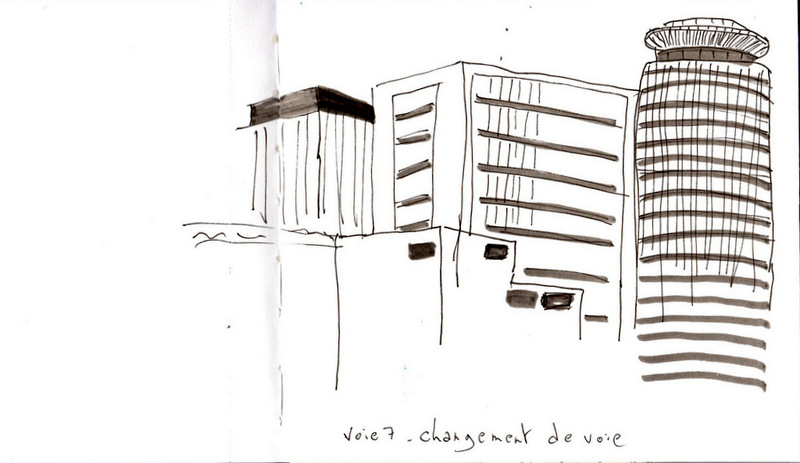 Unfortunately, I had even less time, and this view of Brussels North never got beyond this stage. Still, not a bad start to the day! I'm watching rugby on the telly. That has to be a first. It's the Women's Rugby World Cup, it's set in Dublin, and it's Ireland vs Japan, so of course I'm interested. And yes, I'm rooting for Japan! 頑張ってください!! The first phase of the matches is set in UCD, just down the road from us, so it was really easy to get to. 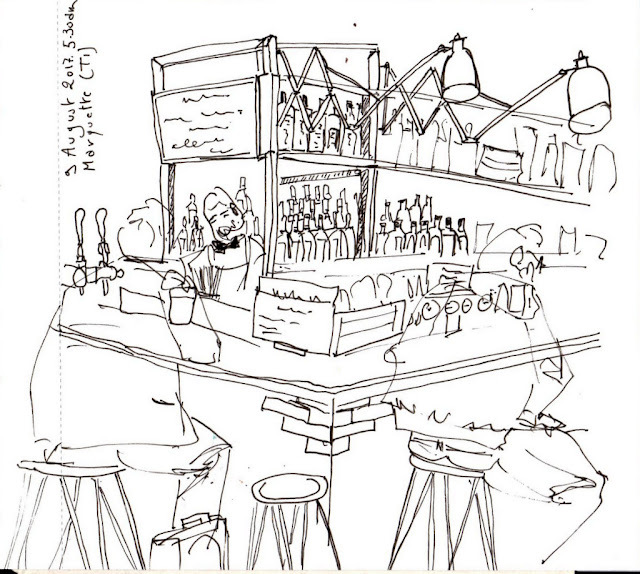 So I spent the afternoon in the Fan Zone (it was the England-Italy match), sat on the ground and started sketching! Several children looked on, and a few grown-ups too, including some young French women, who were surprised when I turned back and thanked them for their kind comments. When I was done, I went over to the Japanese supporters I had captured, and showed them my sketch. They were so pleased they insisted on taking pictures with me and my sketchbook! Unfortunately, I forgot to take my phone out to get a photo too. After that, I walked over towards the all-weather pitches, met with my husband and my dog and we walked around the back, then watched the Japanese team warming up and wished them good luck! So far so good. 27 minutes into the game and it's 0-7 for Japan! In my humble opinion, the Irish team thought it would be easier to beat the Japanese, and they're finding it tougher than they expected. Drawing someone you know is the hardest thing. But I had a very patient subject, who was busy watching the telly, so I was able to try three times. The first two - no likeness whatsoever (the second one actually looks more like a neighbour, strangely enough), but the third one, I feel I can recognise him, and I hope that others do too. I often find it hard to stop with one attempt - that's the nature of watercolours - you have to explore the process through more than one painting, as opposed to acrylics, where you develop a work through layers. As is often the case the first one is the best. Second, on bigger paper. I like how the petals worked out. Third, on smaller page, with salt to create the seeds in the centre. But the petals are too orange. Tried a bigger one, but the salt didn't work for some reason. I must explore that further. Obviously the ambiant temperature and humidity will affect how the salt pushes the pigment, but the weather had not changed to any great extent between these two paintings. I tried to "fix" the last one by adding oil pastel. Clearly didn't work. Time to move on. Another Sunday, another sketching location. And rain again. This is August in Ireland. But I bumped into a friend just as the rain was starting and we took shelter together, and chatted for a while under the trees by the canal. Then we scouted for a good location where we could stay dry. And we found the Eat Yard, just beside the Bernard Shaw pub in Portobello. I wasn't particularly hungry, but I got chips from the Box Burger. My fellow sketcher got a sweet potato burger. And we set to work. This is not something I was aware of until Sunday, but food truck culture has hit Dublin. Now cars are not my strong suit. We've established that already. But this one wasn't going nowhere. So I started with the overall shape (more or less) first, then I went back in for detail, jumping from one area to the next every time I struggled with a particular point. And no, I'm not sure I'll ever manage to fit the bottom of my subjects onto the page. You'd think at this point I'd remember to start at the bottom, or draw higher on the page. Or start with a quick pencil outline. One day maybe. But then I wouldn't be me. And where would be the fun in that? 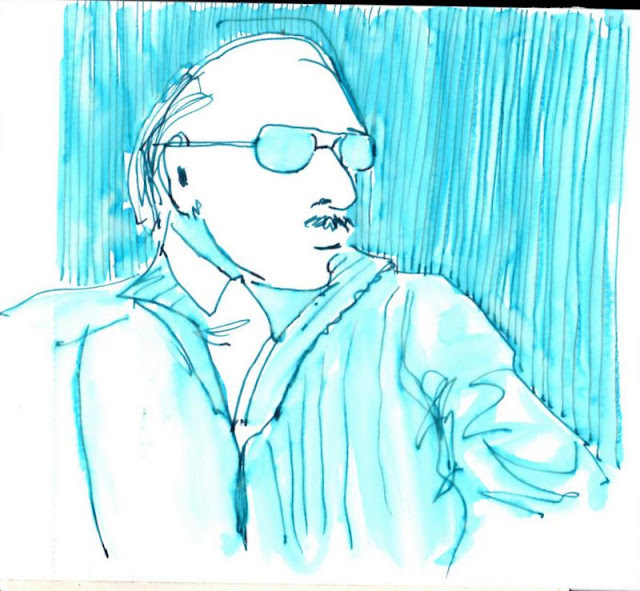 I haven't yet developed the ability to sketch things and people at the same time. But there were loads of young people hanging around the yard, fathers with young children (one little boy stole an eraser, and when it fell to the ground, it looked exactly like the gravel under our feet - he looked fairly cross when he was asked to pick it up and hand it back! ), young couples, first dates. There was a young man and a young woman in very intense conversation. Although I wasn't listening to what they were actually saying, it sounded like a first date. And the young man was working hard at impressing the young woman! I wish them well for the future! The man behind the counter at Burn Baby Burn was so impressed with my sketch that he took photos of it to include on their instagram page! But unfortunately, I can't find it anywhere - there are just too many people using burn baby burn as a hashtag! Still, it was a very pleasant afternoon, despite the rain! It was one of my goals for the summer, to go down to Belfield and sketch. Better late than never, but it looks like this will be my only chance, unfortunately. I won't even be there for the Women's Rugby World Cup. Which is a shame, as even the training sessions would be great sketching opportunities, particularly with the Japanese team there! But never mind, Belfield will still be there next summer, and I'll make sure to reserve time for my own goals, rather than getting caught up in other things. I know I've only got myself to blame. A little better time management is all that would have been needed. But sometimes, I just don't have enough energy. This is one of my favourite spots, by the way, a quiet courtyard between the old and new science buildings, where a majestic old tree stands, watching over generations of students going by. Funny that before we got Timber, I always found Belfield boring, just a concrete jungle with no good view of the mountains or the sea. They say that familiarity breeds contempt. But in my case, it's the opposite. I've grown quite fond of the place. It's within easy reach of home. Timber loves it. It's quite safe, even when he is off the leash. Although there are a few s.q.s (squirrels) and r.a.t.s (rats). Which can be quite distracting. And swallows in the summer. We had to keep him on the lead for most of the walk this morning, as several of the rugby teams were training on the grounds. But he didn't seem to mind. And there are a lot of interesting buildings and views that would make great urban sketches. Well, at least, I've captured one so far. I did paint a view of the pitches last year, a lovely painting I sold. Well, maybe I didn't hit my goal for the summer, but, come September, I might go there on Saturday mornings to sketch and paint. Nothing to stop me! We watched Chasing Coral on Netflix a few days ago. And it is scary. Scarier than Al Gore's An Inconvenient Truth (Although I hear there is a sequel, so that will be one to watch out for). Scarier? Why? Because it shows you what's already happening, the coral reefs around the world are dying because the sea temperature continues to go up, leading to coral bleaching and death of a whole ecosystem. Coral reefs hold 25% of the oceans' fish. And when the reefs die, the fish die too. A bit like having the whole Amazonian forest disappearing. And worse in a way, because most people don't have any idea what it's like, and probably don't care. I just find it so sad that my young nephew will probably never get the chance to snorkel over the reef and see turtles, black-tip sharks and eagle rays swimming all around him. I know that many people have never had the luck to see this alien world on our blue planet, but believe me, it's amazing. There is nothing to prepare you for the feeling you get when you swim over the reef for the first time, and it's like you're floating in space. Or when you swim out of the lagoon and find yourself face to face with an eagle ray, who is as surprised as you are to see you there. Or the pure joy of snorkelling in a shoal of blue triggerfish. 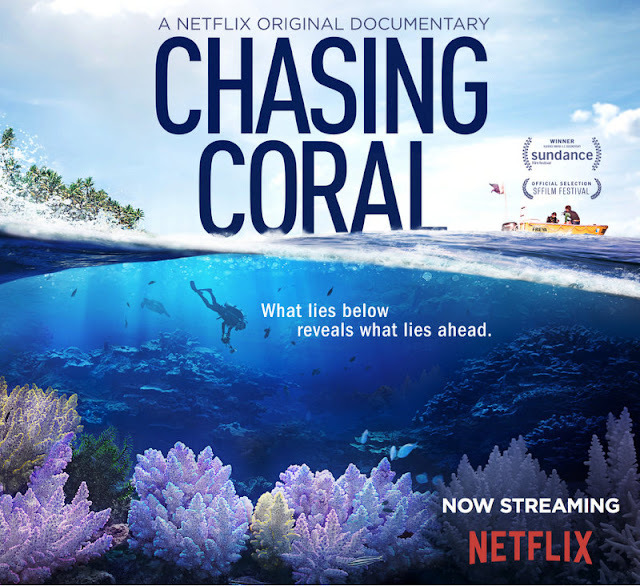 Chasing Coral is basically showing how quickly that whole world is dying. And given how little our politicians, or most people for that matter, care about climate change, I'm not seeing a happy ending, unless we wake up and start taking action. There was a scene in the movie where the crew are filming on the Great Barrier Reef in Australia. And when they come up to the surface to the base they've rented for the duration, it's a party platform where young people are drinking, dancing and flirting, with absolutely no interest in the reef itself. I found that scene so sad. Our world is dying and the generation who will be affected by it don't know and don't care. Now, I'm not perfect. Despite my effort to walk rather than drive to the local shop, to eat less meat, to recycle and avoid unnecessary consumption, I found that my environmental footprint was 176% of the UK average!! Too many flights this year! But at least now I know, and I can try and do something about it. 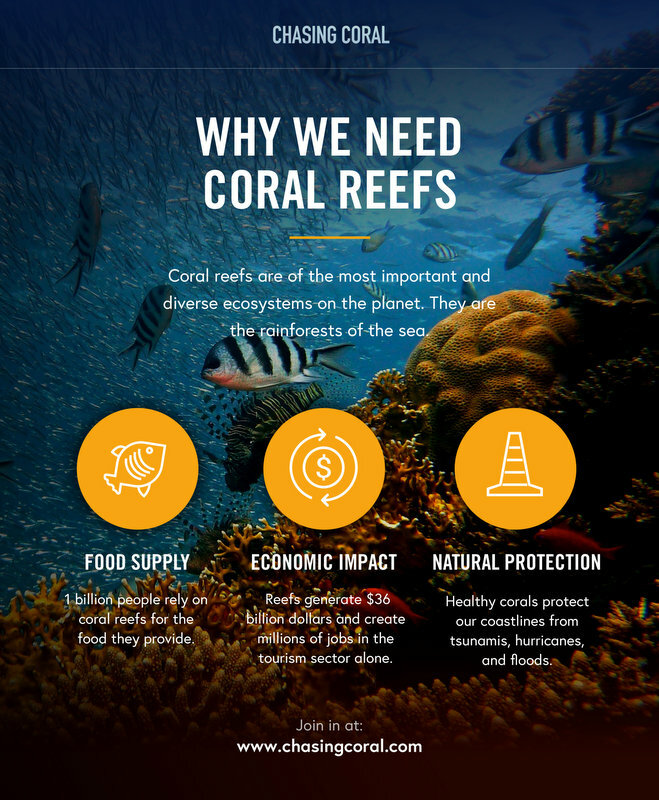 Why don't you try out the footprint calculator and see what your impact on climate change is, and what steps you can take to make our world a better place, a place where the next generation will be able to live, and maybe enjoy a swim/dance with all the exotic fishes on a coral reef somewhere. Because let's face it, who wants to live on Mars? It wasn't the perfect Sunday. 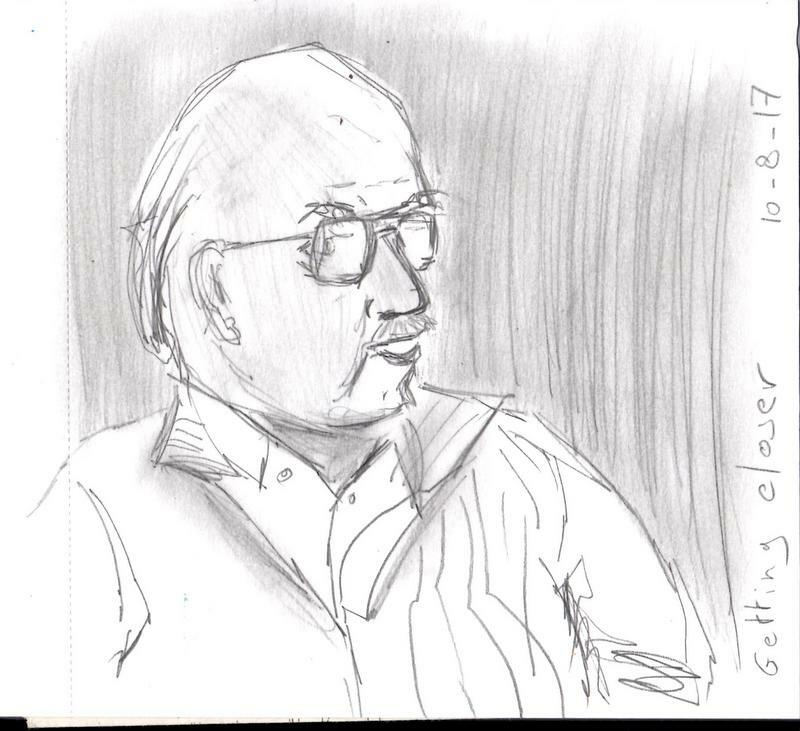 But after missing two weeks, I was determined to make it to Dublin Sketchers last Sunday. Things were going well. I got parking right outside our location, Griffith College. And it looked like it was going to be dry for half an hour at least. Then we found out that permission was required, as young kids were staying there in the summer. We didn't have permission. Some people headed towards the canal. I took one look at the darkening sky and said "You can do what you want. I'm going to the café" Some of them were not seen again. I heard of one person who went home after getting wet. This is August in Ireland. When it rains it rains. So, what do sketchers do when they are stuck together in a café for a couple of hours? They sketch each other, of course. And chat. And drink tea. And eat. That too. For some insane reason, I decided to paint directly to watercolour. No preliminary drawing. No measuring. And I had a ball. You will not recognize these people. James is thinner. Des has a more interesting jawline. And Marina is much prettier. I hope they forgive me! I forgive them. And I found a use for graphite grey - perfect for painting black-framed glasses! Still jumping around from one idea to another. And I haven't touched monoprinting this summer yet! It would be really useful to have another working table so I could go back and forth between watercolours and monoprinting That will require a serious reorganisation of my little room, though. I've looked at the Ikea website, and they don't have anything narrow enough for my room. 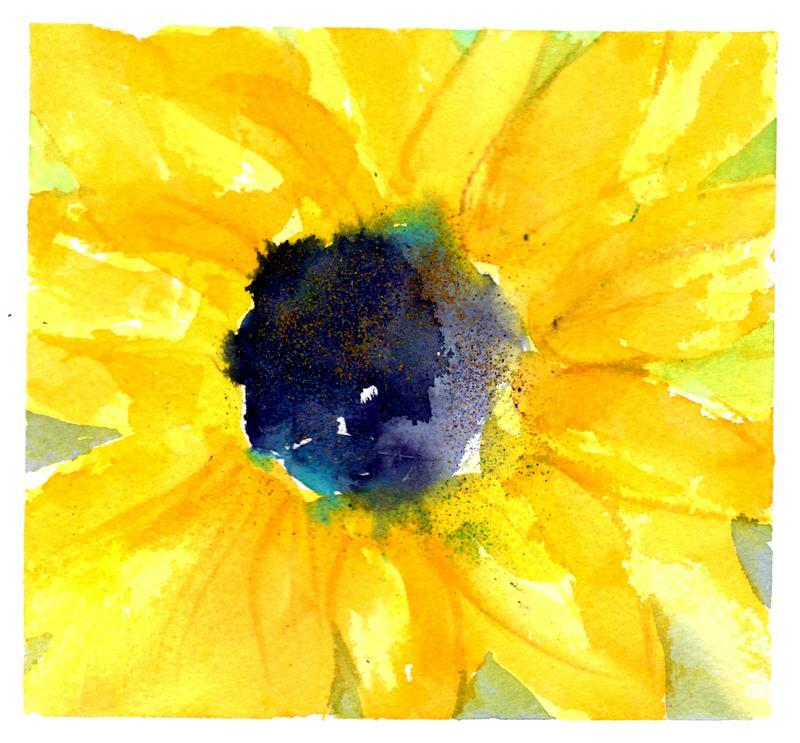 So, rather than trying to tackle the whole sunflower field and landscape, I turned a failed watercolour over and started painting this on the reverse. Exploring transparency and textures was so much fun that I've now started another version in a bigger format. I really need to start painting larger if I want to up my game. And summer is the time for playful exploration. No pressure. No targets. Just pure colour and joy. While I was working with photographs from Béal Bán, I decided to try out a view of the dunes just behind the beach. I really wanted this one to be a "good" painting, so I spent the time doing thumbnails and trying out colour and value dominance options. Again, going back to another one of my bibles, Powerful Watercolor Landscapes, by Catherine Gill. A book more about choices than watercolour technique. But very useful. Sometimes you just need to go back to the drawing board and think before you paint. The eureka moment came when I tried a portrait composition, and decided on a light dominance. Unlike sketching, this one was about product, rather than process. But strangely enough, having done the homework, the process turned out to be extremely enjoyable. And, PS, I'm still playing with these yummy colours, some old (prussian blue, naples yellow), some new (buff titanium, perylene maroon), and what fun it is. Limited palette is definitely the way to go for me. It's hard being a 17-year-old. Particularly when you have diabetes. And you're a cat. But it helps to have a good Mummy and Daddy (I call them Slaves - they're great at opening doors). And although I hate going to the vets, I strangely felt better after I got home. And I did get to meet Bríd and Linda and Kevin and Sarah (she was wearing a funny hat). There was another cat there, going in as I was going out. And he was making a fuss. Not like me. I'm one of their best patients (I think they mean honored guest), they say. I never hiss or lash out. Except when they clip my nails. Don't like that. This time, I came home with this thing wrapped around my leg. It catches when I walk, particularly going up the stairs. And it makes getting in and out of boxes really hard (Female Slave came to the rescue, thankfully). First, they wouldn't let me out. And then, when they finally obeyed my orders, the front exit was blocked. What use is that? But then they gave me freshly-cooked chicken breast. Not the boring dry stuff. No even AD. It was so moist and tender. The real taste of chicken. Not organic though. I heard them call me Hoppalong. Were they mocking me? Surely they wouldn't dare. Come to think of it, I remember Male Slave using that term for Female Slave a couple of years ago, so it's can't be bad. I think I'll just sleep for the afternoon now. I decided to try out the same Béal Bán view again, with different colours, and then with the same colours again, but experimenting more with contrast and wet-on-wet versus wet-on-dry. The different colour experiment didn't work out. Bloodstone Genuine wasn't a good pigment for clouds afer all. Plus I didn't wait long enough to start painting my mountains. So, instead of giving a soft "cloud-kissing-top-of-mountain" effect, I just got a #fuzzymountain look. But the other painting was fun. I cranked up the Moonglow and it granulated beautifully. And I think I will never tire of West-of-Ireland skies. The next step will be to figure out how to paint an interesting painting that incorporates the clouds, rather than just the clouds. First step would be to lower the horizon. Second, go more abstract in terms of the land and sea. Third, paint bigger. And then what? I think I'm going to have to go back to Donald Teskey's paintings, that's what. A little ambitious, yes. But what have I got to lose, except my sanity? I'm all over the place at the moment. Just recovering from that cold, I am jumping from one idea to the next without plan or reason (yes, I know, it's supposed to be rhyme or reason). I've only been sick for 5-6 days, but I feel I've missed out on so much and I really want to catch up and do, well, everything. Back to the usual wake-up call - even if I live to 100, I will not get to do everything I want to do. That's the problem with being on the wrong side of 50, you look at life in terms of how much time's left. And that's scary. But then it makes me even more determined to live to 100, which, let's face it, is highly unlikely. Yes, there is longevity in my family, great-grandmother died at 92, grandmother at 89. But, despite my healthy living, I have a few medical conditions that will probably lead to complications as I get older. And I did smoke until the age of 28. Or was it 32? Anyways. Lots to do. Lots more to do. This one is an attempt at sketching San Marco's Basilica in watercolour only, no drawing, no measuring, no planning! I started with a negative-space rendition starting with the sky. That was a good way to draw all these domes without thinking about it too much. These large domes and turrets are tricky. But once I had a silhouette, all I had to do was work my way down that building, one feature at a time. I know I should have added lots more people, and probably smaller people to give the sense of scale, but I got bored with it in the end! Still, for a first time tackling this difficult subject, I was happy with how it went. I must remember this for the next time I go to Venice - it would be so fantastic to paint this from life! As you can see by the yellowy-grey tint of the paper, the photo doesn't do this little piece justice. So when I set to work on this with my new paints, it was all about the clouds. Such fun! Buff Titanium, Lavender and Moonglow, with a touch of English Venetian red towards the horizon. It all moved and blended and pooled just so! As this was also an exercise in controlling the wetness of my paints (I went back to yet another one of my watercolour bibles, Watercolor Painting, A Comprehensive Approach to Mastering the Medium, by Tom Hoffmann, after a disappointing landscape painting), I had to wait just the right amount of time before I started to paint the mountains (prussian blue and moonglow) - I wanted a softness that indicated clouds kissing the mountains, but I didn't want to end up with a complete backrun that would bloom into the sky. The trick is not only to watch the paper, but also to be careful about the amount of water in the brush. Squirrel brushes are not good for that - they hold too much water. After that, the sea (prussian blue + naples yellow) and sand (buff titanium + English Venetian red) were easy! That just makes me want to paint more! PS: yes, I've changed the theme background and width on my blog. After so many years, it was about time!